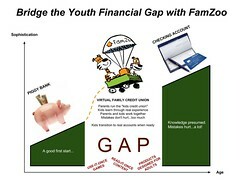 Will your credit union be joining the youth financial education thought leaders in 2012? To schedule a live demo for your credit union, CLICK HERE. It’s easy. Check out the quick slide show below. You can also view it directly on Flickr and slideshare, or you can download the presentation in PDF and PowerPoint formats. NOTE: For best results, view in full screen mode. Slide 1 of 18: The Gap. There’s a huge educational gap between the piggy bank and the commercial checking account. As with any significant skill, mastering personal finance requires instruction and practice — lots of practice. The piggy bank is a good first start for the very young, but it quickly runs out of steam as an educational tool. On the opposite end of the spectrum, the traditional checking account is designed for adults and presumes considerable amounts of knowledge and maturity. Mistakes can be costly and carry lasting implications. To learn the financial ropes, kids need something in between: a solution that teaches progressively more sophisticated personal finance skills through real experiences without onerous punishment for the inevitable failures. Mistakes must be considered an opportunity for learning, not profit. Also, since money and values are so deeply intertwined, kids need to work closely with their parents. But parents are insanely busy, so the solution must be quick to set up and painless to maintain. Slide 2 of 18: How does it work? Parents run their own private online “credit union” for their kids. The accounts in this credit union aren’t real financial instruments — they’re “virtual accounts.” A virtual account balance simply represents how much the parent “owes” the child at any given time. From the child’s perspective, a virtual account is still very real. The parents are the virtual credit union managers. 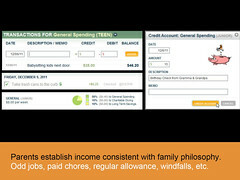 They credit accounts for deposits, chores, odd jobs, allowance, gifts, interest, etc. Most of these credits are automated after a one-time setup. Parents hold on to the real money for safekeeping while kids make goals and save. Parents debit accounts after purchases, donations, or withdrawals. The kids are the virtual credit union members. They learn to spend, save, and give wisely through regular hands-on practice. Kids collaborate with their parents in a private, friendly, educational environment and learn from their mistakes without doing any serious real-world financial damage. Slide 3 of 18: Friendly Online Access. 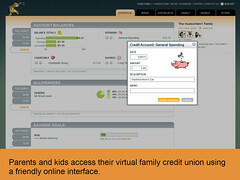 Parents and kids can sign into their private virtual family credit union through a friendly online web interface. As the managers, parents see and control all of the accounts in their family. Kids only see their own accounts with access permissions that are determined by the parents. Slide 4 of 18: Match Policies With Values. As the managers, parents are in charge. It’s their credit union; they make the rules in a way that matches their unique family philosophy. For example, when it comes to a child’s income, parents can decide whether it’s based on odd jobs, paid chores, regular allowance, birthday gifts, or whatever — perhaps even some combination. Slide 5 of 18: Incentives That Kids Can Appreciate. 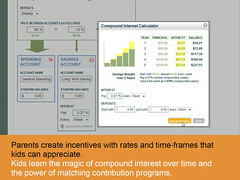 Do you really think the annual interest rate on a real savings account is going to motivate a kid to save? Nope, that’s not gonna cut it. 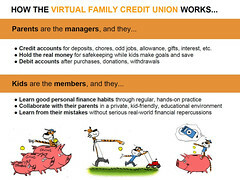 With a virtual family credit union, parents can offer incentives with arbitrarily aggressive rates and time-frames. Let parents decide what it takes to communicate the magic of compound interest and jump-start good saving habits with their own kids. 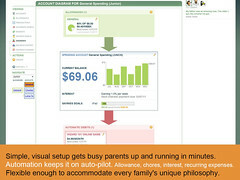 Slide 6 of 18: Kids Monitor Their Own Money. Kids can monitor their own accounts and transactions using a web browser, a mobile interface (iPhone app or Android), or text messages (any mobile phone). 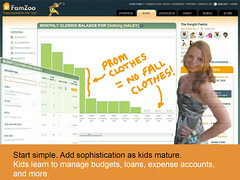 With FamZoo, kids learn to live within their own means, not their parent’s. Slide 7 of 18: Set Goals, Make Plans, Monitor Progress. 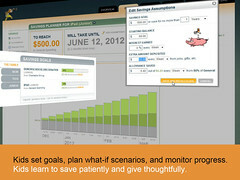 Kids can make saving and giving goals, plan what-if scenarios for achieving them, and track their progress over time. With their parent’s guidance, kids will learn to save patiently and give thoughtfully. Slide 8 of 18: Start Simple. Add Sophistication As Kids Mature. 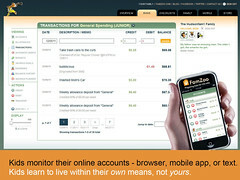 FamZoo’s broad spectrum of personal finance tools allows parents to start very simple with their youngest kids. As children mature from youngsters to tweens to teens, parents can add sophistication incrementally. Older kids can learn to manage budgets, loans, expense accounts, and more as they gradually transition to your credit union’s real world financial products. Slide 9 of 18: Quick Setup. Auto-Pilot. Parents are insanely busy! They need a simple, visual setup that gets the family up and running in minutes. They need automation to keep things like allowances, chores, interest payments, recurring expenses, and reminders running smoothly in the background. That’s exactly what they’ll get with FamZoo. Slide 10 of 18: Deliver Great Education. Grow Membership. 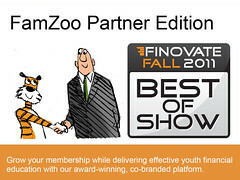 Using FamZoo Partner Edition, our award winning co-branded platform with its built-in targeted advertising engine, credit unions can deliver effective youth financial education while capturing new members as they naturally transition to real world financial products. Slide 11 of 18: Super Simple Implementation. 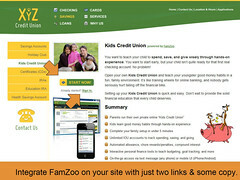 You can integrate FamZoo on your credit union’s site with just two links and some copy on your youth financial education landing page — no software installation or fancy back-end integration required. Your IT department won’t be freaking out. 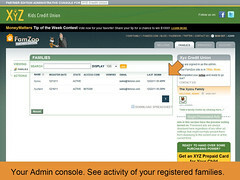 FamZoo doesn’t move any real money around or hold any real account info either. Your security officer can rest easy. 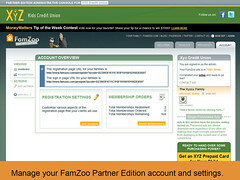 Get your FamZoo Partner Edition up and running in minutes. Slide 13 of 18: Custom Look. Custom Content. Parents and kids from your registered families will see your custom co-branded styling as well as your targeted content. 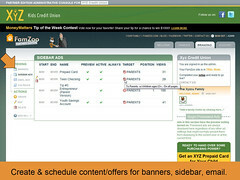 Your custom content can appear in the upper banner area and in the right-hand sidebar. The content and the targeted audience segments are entirely up to you. You might include age and situation appropriate offers for your relevant financial products, educational content, links to your social media sites, favorite charitable organizations, or anything else your member families might find useful. Your co-branded styling is controlled through your own custom CSS rules (nerd alert!). If you aren’t familiar or comfortable with CSS, don’t worry! We can help you implement the styling changes you need to achieve your desired co-branded look. Slide 14 of 18: The Administration Console. 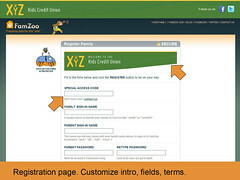 Your FamZoo Partner Edition comes with access to your own self-service administration console. Use the admin console to set up your co-branded look, manage your custom content, and see usage stats for your registered families. Slide 15 of 18: Create and Schedule Custom Content. Use the admin console to create, preview, schedule, and manage your custom targeted content. 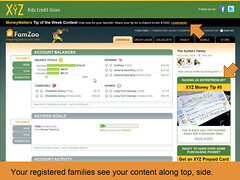 Your content can appear in banners across the top of FamZoo web pages, in sections within the right-hand sidebar, and within emails sent out by FamZoo to your registered family members. Slide 16 of 18: Target Your Content. 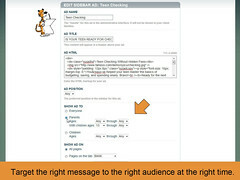 Use the content targeting options to get the right message to the right audience at the right time within the right part of the FamZoo application. For example, you might choose to schedule a special prepaid card offer to appear in the second position on the sidebar of the Overview page during the month of January to all parents with a “tween” or a teen. Slide 17 of 18: Manage Your Account and Settings. The Account tab in the admin console is where you can find your special registration/sign-in URLs, manage your custom registration page settings, and keep an eye on your family subscriptions/renewals relative to what you’ve ordered so far. Slide 18 of 18: Questions? Contact Us. 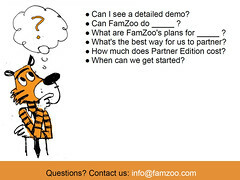 Do you have any questions about FamZoo Partner Edition? Would you like to schedule a detailed demo and discussion session over the Web using GotoMeeting? We’d be delighted to talk to you about bringing FamZoo to your credit union — just contact us here. Credit unions, ready to get started? Wow, great post, guys.Thanks for sharing this nice post.